Thank you so much to those who came out at the last clean up on June 11th! We should have an article in the Farragut Press written by Ben Pounds, who came to volunteer with us at Founder’s Park. We’ll post a link to the article here once its available. 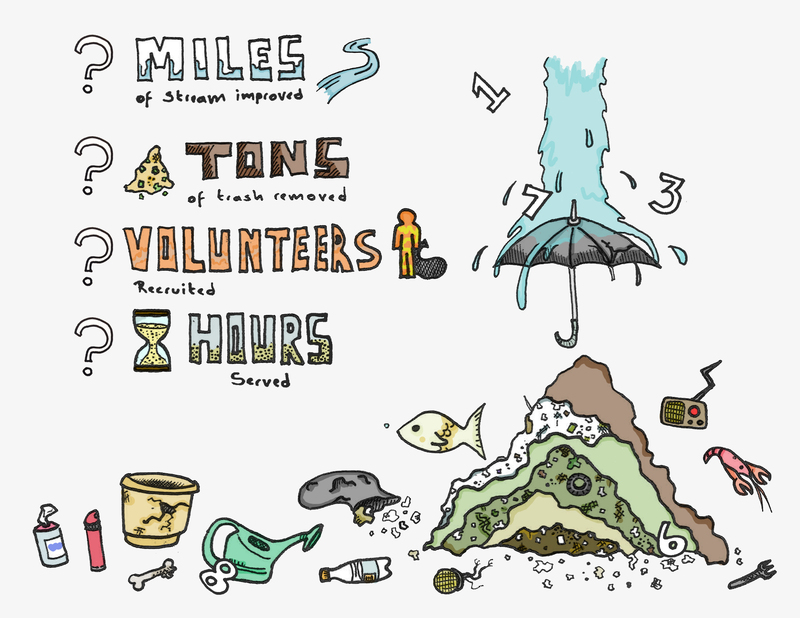 We have collected 337 pounds of trash through 1 Year Down the Drain: Turkey Creek thus far, and I could not do that without some committed volunteers; THANK YOU SO MUCH!!! 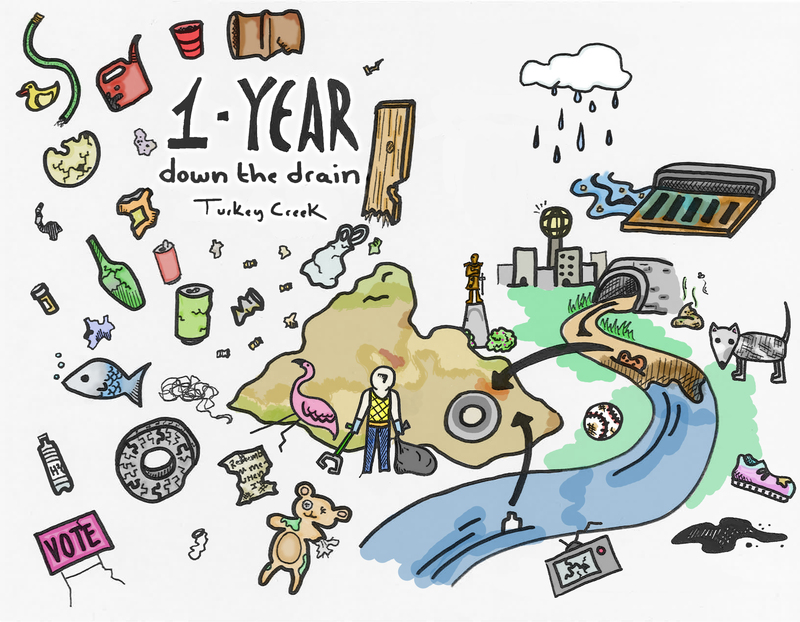 1-Year Down the Drain: Turkey Creek is a collaborative service project inspired in the summer of 2015 by a conversation between Dr. Annie Gray with Pellissippi State Community College and CAC AmeriCorps Program Director, Jason Scott, after a previous collaboration on a rain garden installation at the Town of Farragut’s Outdoor Classroom. The general premise of the project is to engage students at Pellisssippi State Community College and the broader community in the intensive, year-long, collection of found objects from Turkey Creek. These collection sessions will involve cleanup and general informal conversational dialogue regarding stormwater and water quality. 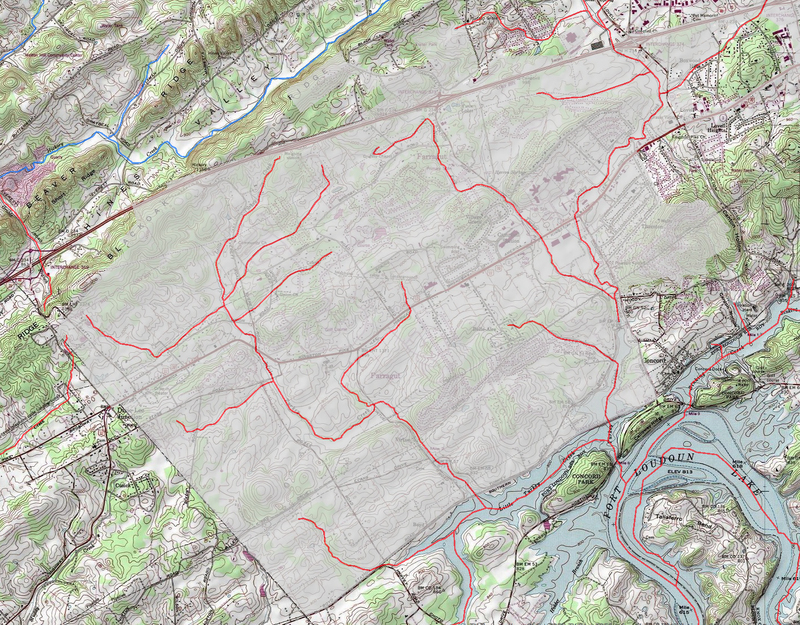 Cleanup locations will change from cleanup to cleanup as will the primary topic of discussion. 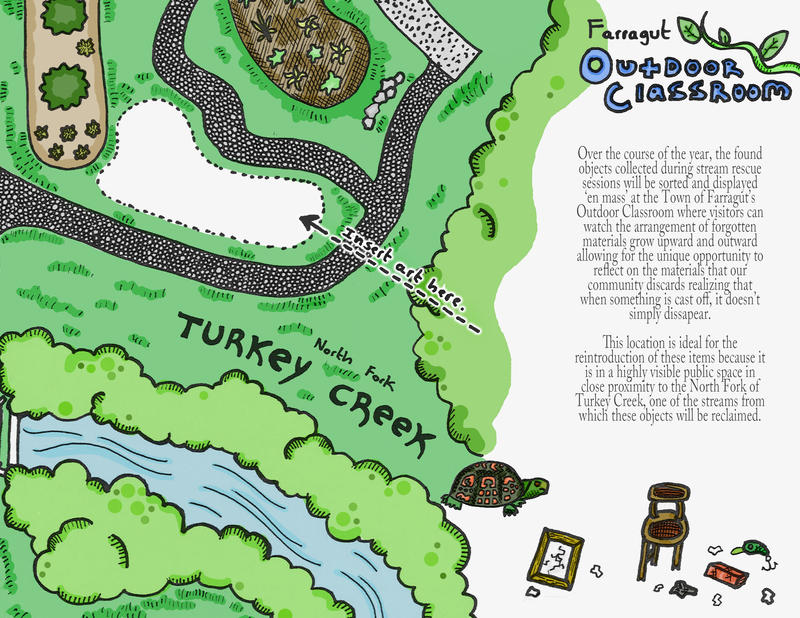 Materials that are collected will be stored en mass at the Town of Farragut’s Outdoor Classroom between September 2015 – September 2016 to serve as a sort of site-specific art installation allowing the public to view the ephemeral presentation of found objects. At the conclusion of the project, all materials will be sorted and either recycled, sent to the landfill or transformed into art objects. 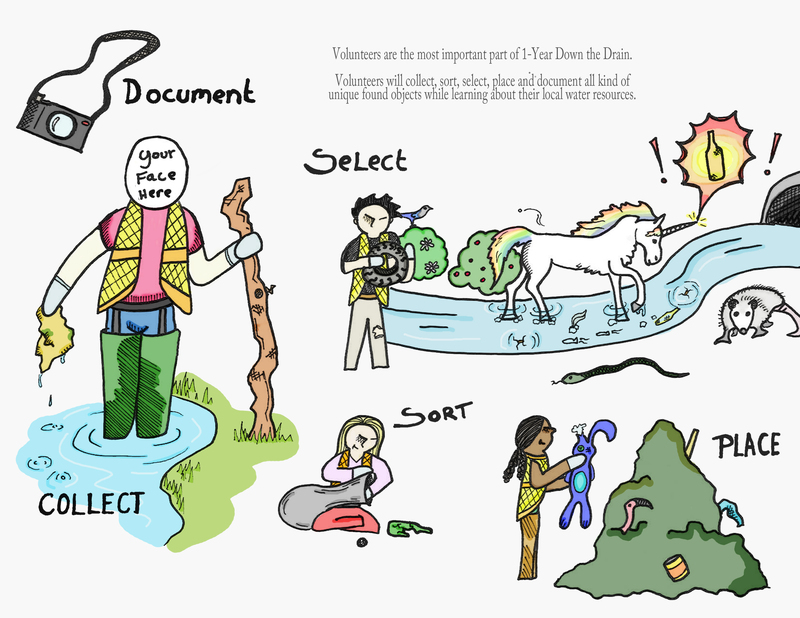 The project will culminate with the production of an “exhibition program” featuring illustration, photography and other elements that chronicle the year of cleanups, the materials collected and their reintroduction to the public. Why volunteer? 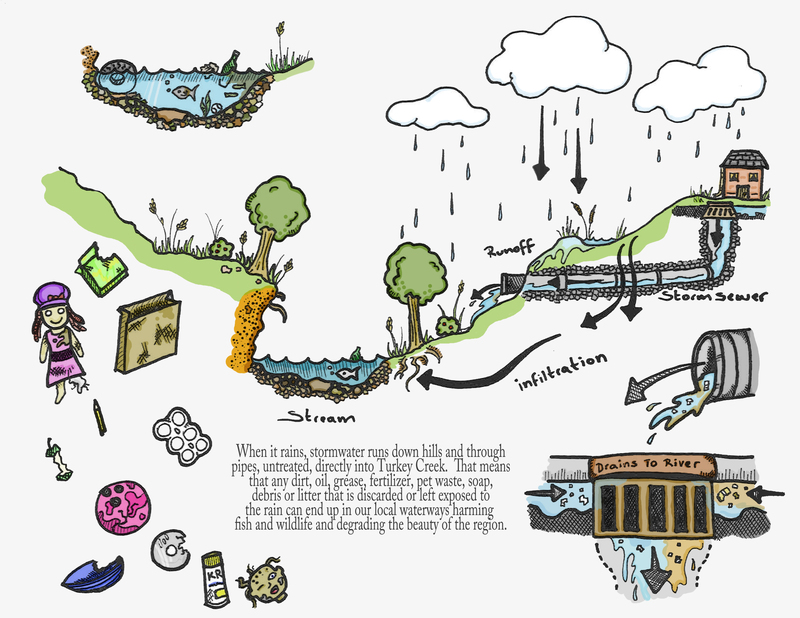 Be a part of a unique project that combines the arts and sciences and learn a little bit about water quality while you’re at it. Hours served with 1-Year Down the Drain: Turkey Creek will count towards the 8-hour a semester service requirement for the TN Promise scholarship at Pellissippi State Community College as well as towards the 40-hour service learning requirement for graduation from Farragut High School. Total service hours available for are estimated between 40-60. Volunteer slots for some events will be filled on a ‘first-come, first-served’ basis. There is no minimum number of hours required to participate, volunteer when it works for you. Contact Joseph to Register as a Volunteer! All Volunteers Must Fill Out & Return The Liability Waiver Form Before Participating. 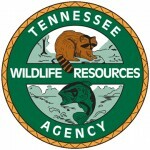 Return the Form To 11408 Municipal Center Dr. Farragut, TN 37934 Or To The Volunteer Coordinator At Your Stream Rescue. Volunteers Under 18 Must Have Their Parents Co-Sign The Release Form. 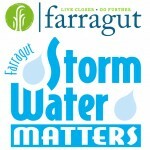 Joseph comes to the Town of Farragut’s Stormwater Matters program after completing a year of AmeriCorps service with Knox County’s 7-person Water Quality Team. Originally from North Carolina, Joseph graduated with his Bachelors degree in Environmental Science from Western Carolina University. Joseph is the program lead for One-Year Down the Drain: Turkey Creek. Joseph has a passion for foraging for and cooking with mushrooms, urban agriculture and water quality. When not working on 1-Year Down the Drain: Turkey Creek, Joseph will be working to nurture food crops and volunteerism at the Town of Farragut’s Outdoor Classroom. 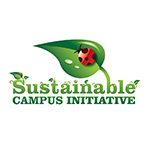 Karen is the Coordinator of Pellissippi State Community College’s groundbreaking sustainable campus initiative, an award winning sustainability program that has placed Pellissippi State at the forefront of community college sustainability initiatives in the southeast. Karen received her Bachelor of Art in Mass Communication from Middle Tennessee State University. Karen will work with the leadership team to tie 1-Year Down the Drain: Turkey Creek into the broader sustainability initiatives at Pellissippi to optimize participation and impacts. Thank you to the following partners for providing volunteers, coordination and funding to make this project a reality.